By Jake Metcalfe - Lew Williams Jr., former publisher of the Ketchikan Daily News, recently attacked the news media in general and the Democratic Party in particular for the scandals troubling Alaska's two senior elected Republicans in Washington, D.C. He has been in the news business for too many years, beginning with his newspaper route when he delivered papers to my grandfather's house in Juneau at the top of Gold Street some 65 years ago. It is the job of news reporters to report. If, as Williams suggests, there is nothing to worry about, then it will blow over. But considering Rep. Don Young's connection to Jack Abramoff and Sen. Ted Stevens' connection to VECO, for any journalist who purports to cover the political beat to ignore these stories would be unprofessional and a violation of the public's need to know. Williams suggests news reporters at least try Googling sources. 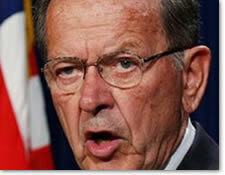 Well, Lew, try this: If you Google "Don Young" plus "corruption" plus "Jack Abramoff," you'll get 22,000 hits. Googling "Ted Stevens" plus "corruption" plus "VECO" nets 27,000. With this much smoke, it's worth looking for a fire. If so, either the FBI or some enterprising journalist will find it. As for Williams' attacks on the Democratic Party, I'll remind this former reporter and former Democrat, that the trans-Alaska oil pipeline would never have been built but for the Democratic Party. At the time the pipeline was approved, there was a Democrat in the Governor's Mansion, Democrats controlled both Houses of the Alaska Legislature, Democrats sat in two of Alaska's three congressional seats, and Democratic majorities controlled both the U.S. Senate and U.S. House of Representatives. I represent Alaska Democrats. Alaska Democrats have a long history of supporting progress and projects such as the Alaska gas line. We are proud of our history of advocating and representing the interests of Alaska's working people - blue collar and professional. I can assure Alaskans that on my watch the Alaska Democratic Party will continue these traditions. Poor Lew. He is reduced to throwing weak mud balls. As for our Alaska corruption scandals, I honestly pity Lew. He and his fellow travelers are reduced to defending the indefensible: corruption of the lowest sort - selling out all Alaskans (including future Alaskans) for the benefit of the world's most profitable corporations, and doing this for pocket change. Judging from the tone of Lew's column and several letters to the editor, one would think the indicted are the victims. They are described by these writers as honest, intelligent, productive members of the community. I'm a former district attorney, and I can't tell you how many criminals I've successfully prosecuted that played the victim despite overwhelming evidence. As a prosecutor, I always found that to be the surest sign the defendant could not be rehabilitated. Lew, the hard working people of Alaska don't buy your victimization defense of these corrupt bastards, or your attack-everyone-else game. As one of my colleagues once said, "There are only three types of crime: stupidity in the first, second and third degree." And few crimes are more stupid than those committed by arrogant people who believe they are above the law. Jake Metcalfe is chairman of the Alaska Democratic Party and a former district attorney for the state of Alaska.